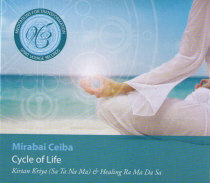 Cycle of Life is an incredible musical offering from Mirabai Ceiba, with soaring vocals and an orchestra of world instruments that will take you deep into an experience of the self. Kirtan Kriya is a meditation to bring balance to one's life by connecting with the cycle of creation. Healing Ra Ma Da Sa is the most powerful healing meditation in the Kundalini Yoga tradition. The Kirtan Kriya - Sa Ta Na Ma track on this CD was recorded especially as instructed by Yogi Bhajan, with 5 minutes of singing out loud, 5 minutes of whispered recitation, 10 minutes of silent meditation, 5 minutes of whispered meditation, and then 5 minutes out loud with 1 minute of meditation, making a 31-minute meditation.